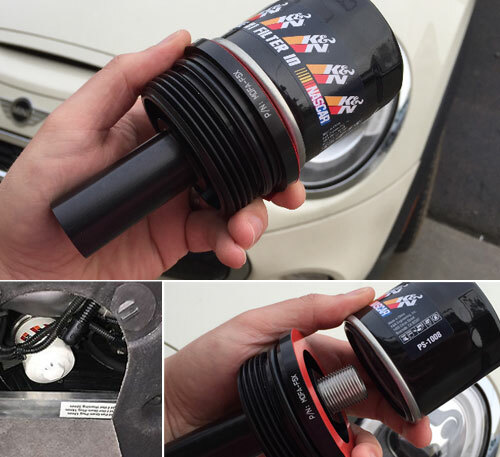 If you just don't want to deal with sourcing and keeping OEM MINI oil filters on hand or want the performance benefits, ease of installation, cleaner install and performance of a traditional canister/spin on type oil filter, this Spin On Oil Filter Conversion Kit for MINI F55/F56 is going to impress you. Features a black, hard coat anodize (Diamondyze). During a 3 week test period, monitoring oil pressure and oil temperature and other engine vitals the only change from stock noted was a 5 degree F reduction in oil operating temperature. There were no issues with fit or access and oil filter changes will follow the same process as stock (utilizing the trap door provided in the under pan). Includes KN oil filter part #PS-1008 which is easily sourced from any KN dealer when a replacement is needed. No longer do you have to be tied to the dealer for your oil changes because your local shop doesn't carry the Mini-specific filter element or the special housing items needed. No longer do you have to worry about cracking the plastic cap, or even worse the plastic housing. This installation requires no cutting, or drilling and is totally reversible, but once installed the adapter remains in place allowing the use of readily available spin-on filters from numerous national vendors. And your filter threads onto a CNC machined aerospace aluminum housing not some flimsy plastic housing. Full color installation instructions and a compatible K&N spin-on filter are included.